Posted on Sat, Jan 21, 2012 : 5:09 p.m.
Arkansas' B.J. Young drives to the basket against Michigan's Stu Douglass during the Razorbacks' 66-64 win Saturday in Fayetteville, Ark. FAYETTEVILLE, Ark. -- The Michigan basketball team nearly came all the way back again on the road. The key word being nearly. After falling behind by as many as 20 points in the first half and trailing by 13 with less than seven minutes to play, the 20th-ranked Wolverines found themselves with a chance to steal one on the road at Arkansas on Saturday. The chance was missed, however, when freshman point guard Trey Burke missed a 3-pointer at the buzzer, giving the Razorbacks a narrow 66-64 win. "I looked at the clock and there was about three seconds (left)," Burke said. "So I took a step-back, (got the shot up), it looked good -- it looked real good. "It just didn't go in." The loss dropped Michigan (15-5) to 0-4 in true road games this season. The Razorbacks, meanwhile, ran their home record to a perfect 14-0. The Wolverines (15-5) were oh-so-close to stealing another game on the road late. But as was the case earlier this month at Indiana, being close wasn't good enough. Michigan nearly erased a 20-point first-half deficit at Arkansas, pulling within two in the closing minutes after a 12-1 run. But Trey Burke's 30-footer at the buzzer swirled in and out, keeping Michigan winless in four tries on the road and leaving Arkansas a perfect 14-0 at home. Over the game's first 10 minutes, Arkansas could do no wrong. The Razorbacks started the game 11-for-11 from the floor, hitting 3-pointers, layups, fade-aways and free throws. Arkansas' first miss came on a Rashad Madden 3-point attempt from the corner with 9:49 left in the first half. At that time, the Razorbacks had already built a 29-10 lead. Michigan senior captain Zack Novak drew the ire of 19,050 fans at Bud Walton Arena after a flagrant foul early in the second half sent Arkansas freshman B.J. Young crashing to the floor. Young eventually made his way to the bench, and Novak said he had no intention of hurting Young, hoping he was OK. Despite being booed each time he touched the ball the rest of the night, Novak finished with a team-high 17 points and eight rebounds. "I looked at the clock and there was about three seconds (left). So I took a step-back, (got the shot up), it looked good -- it looked real good. It just didn't go in." It was the second time this month that Michigan erased a pair of double-digit deficits in a game. 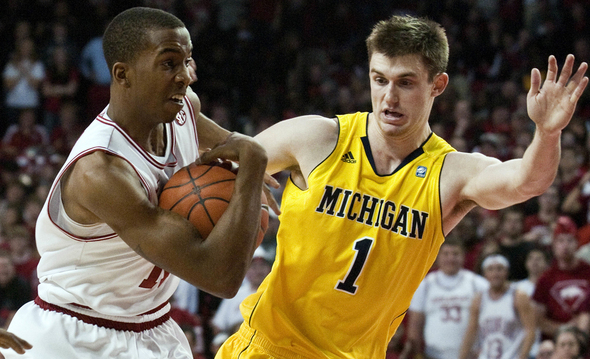 The Wolverines nearly stole a road game at Indiana earlier in January before falling by two. "You've got to give them credit, they made plays, they hit some shots," said Michigan senior captain Zack Novak, who finished with a team-high 17 points and eight rebounds. "We did some things we'd probably like to take back, but give the guys credit, we fought back and gave ourselves a chance at the end." Sophomore forward Jordan Morgan chipped in with 16 points and six rebounds for the Wolverines, while Burke finished with 13 points, seven rebounds and six assists -- but went just 6-of-19 from the floor. Tim Hardaway Jr. struggled to find any consistency, finishing with nine points and seven rebounds on 3-of-8 shooting. Arkansas put four players in double figures, led by B.J. Young's 15 points. Arkansas shot 65.4 percent from the floor during the first half before finishing 24-for-48 on the day. Michigan ended its night 25-of-61. The first 10 minutes of the game couldn't have been a bigger nightmare for Michigan, and couldn't have been any more perfect for the Razorbacks. Arkansas began the game 11-for-11 from the floor, sprinting out to a 29-10 lead after a Hunter Mickelson jumper, sending the sellout crowd of 19,050 at Bud Walton Arena into a frenzy. "They came out and they made all their shots," said Michigan coach John Beilein, who called Arkansas the quickest team the Wolverines have played all season. "It's tough to simulate (their speed), now I know (what people talk about) when they play the Southeastern Conference in football." The Razorbacks led by as many as 20 points in the first half, but Michigan held tough. A Novak 3-pointer late cut the lead to 13 at halftime. Michigan stormed out of the gates in the second half, using a 10-0 run -- highlighted by three straight Morgan dunks -- to get all the way back within six at 49-43. Arkansas responded, though. Minutes after Novak was whistled for a flagrant foul against Young, the Razorbacks used a 7-0 spurt to push the lead back into double digits, leaving the score 61-48 with 6:45 to play. But as it had done all night, Michigan found a way back. Morgan and Hardaway racked up six straight points, then Burke and Novak hit back-to-back 3-pointers, capping a 12-1 Michigan run to make it a 62-60 game with just 3:37 left. It was the closest the Wolverines had been since the game's opening minutes. Unfortunately for Michigan, though, it would get no closer. "Michigan made a run at us," Arkansas coach Mike Anderson said. "But one thing we didn't do, we never relinquished the lead. "Our players had something to do with that, and the atmosphere had something to do with that." Mickelson made it a two-possession game again with less than a minute to play, rattling home a hook in the lane with the shot clock winding down, making it 66-62 Arkansas with just 42 seconds to go. Burke hit a layup 18 seconds later to cut the lead to two, and Arkansas gave Michigan a golden opportunity after both Young and Julysses Nobles missed the front end of a 1-and-1 free-throw attempt, giving the Wolverines the last shot. Burke's 30-footer at the buzzer rattled in and out -- leaving the Wolverines with another road defeat. "We were trying to get him downhill, try to get him to the basket or try and look for a three," Beilein said of the last play. "We were going for a two or a three. "I thought it was short out of his hands, after watching literally millions of shots, I thought it would be a little bit short. ... It would've been nice if it had gone in." After the Razorbacks ripped the nets during the first half, Michigan limited Arkansas to just 7-for-22 shooting during the game's final 20 minutes. Michigan also held a 35-29 edge on the glass, and out-scored Arkansas 30-26 in the paint. But in the end, it's still a loss. And Michigan was again left looking for answers on the road. "We're a resilient team, but you've got to learn how to win (on the road)," said Novak, whose team will return to Big Ten play Tuesday at Purdue. "And we're going to do that. Mon, Jan 23, 2012 : 3:25 a.m.
Jb has shown little promise of getting us dominate on the road, I am expecting another middle of the pack finish. Not good for having the Michigan brand behind you. hope I am wrong but may be time for an upgrade. Sun, Jan 22, 2012 : 4:12 a.m. It's hard to win on the road in the , um, Big Ten. I guess harder in the SEC. Sun, Jan 22, 2012 : 3:23 a.m. This is what I like to see! Yep, you got a troll! Sun, Jan 22, 2012 : 12:22 a.m. Going down 20 is the problem. I'm not too confident in this young team. Sat, Jan 21, 2012 : 10:56 p.m.
&quot;Looking ahead, it appears this team may likely end up 17-14 at the end of the regular season...&quot; Please. I don't think so. Down by 20 in this game, M fought back &amp; came within a hair's breadth of winning it. Some of these down-to-the-wire games will go our way, no need to be so pessimistic with this gutsy team. Go Blue! Sat, Jan 21, 2012 : 10:47 p.m.
Can't believe Burke missed that easy shot at the buzzer...not. The slow start really hurt Michigan. Digging out of a hole on the road is very difficult. Hopefully, they start out faster vs. Purdue. Sat, Jan 21, 2012 : 9:55 p.m.
let's not be guzzling the hemlock. this loss was not the killer. i'd suggest that our kids learned a lot and played a pretty good second half. we lost by two at IU (a place where kentucky lost) and by two today. i don't suppose that many of us expected we'd get a shot to win at the end when we were down by 19. too bad the road game at purdue is tuesday and doesn't allow for much rest. as for the 17-14 projection, i'll take that bet. Sat, Jan 21, 2012 : 9:34 p.m. Looking ahead, it appears this team may likely end up 17-14 at the end of the regular season. Penn State on the road is probably a win, but none of the other road games will be wins. 17-14 is not good enough for the NCAAs... NIT here we come. I hope I'm wrong. Sat, Jan 21, 2012 : 11:06 p.m.
17-14? How do you justify that prediction? This team has played pretty well this season. The only really bad game they've had was at Iowa (at Virginia wasn't great, either. But it was still early in the season and they'd just got back from Maui, so I'll give them a pass on that game.) Overall, I think this team is better than any team we've had in a long, long time. They'll get their road wins. They might even pull an upset on the road. Beating Michigan State in East Lansing isn't out of the question, as they proved last season. I see them winning 7 out of the next 11. Give or take a game. Remember, there's still a lot of room for improvement with this team. These John Beilein teams tend to finish the season strong. Sat, Jan 21, 2012 : 9:47 p.m. This team is not finishing 2-10.